A rebel song from the Irish struggle against English colonialism. In April 2018, the Syrian American Council (SAC) issued a press release thanking Trump, UK prime minister May, & French president Macron for airstrikes in Syria, urging them to continue bombing but to protect & prioritize the safety of civilians. It staggers the mind how those who deign to speak for the Syrian Arab Spring could make so many colossal political mistakes in just one brief message. Just like the corrupted antiwar movement has been unable to mobilize thousands to defend Syrian & Russian bombing of civilians, organizations like the SAC have been unable to mobilize thousands to defend US, UK, & European bombing of civilians. What doesn’t the SAC understand about US militarism? What don’t they understand about war when bombing civilians is fundamental to it? 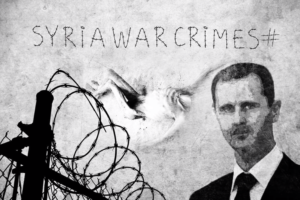 What don’t they understand about the counterrevolutionary role of the US, UK, & Europe in Syria to crush the Arab Spring? With the US bombing Afghanistan, Iraq, Syria, Libya, Somalia, what makes SAC think the US will intervene on the side of revolution? The SAC does not represent a defense of the Syrian Arab Spring but a capitulation to US militarism. They don’t have the political sophistication of an American teenager who couldn’t find Syria on a map but knows that bombing civilians is not the way to bring peace. 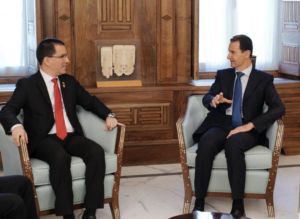 An image tweeted by Free Syria Media Hub in response to Venezuelan Minister of Foreign Affairs Jorge Arreaza praising Assad for his “experience, wisdom & advice for resistance, victory & peace.” It portrays those thousands who have been tortured & murdered, including by hanging, in Assad’s gulag–for which there is considerable photographic documentation. Is this Arreaza & Maduro’s vision of justice? 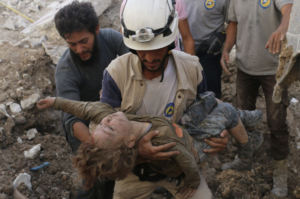 White Helmet rescue workers rescuing a child killed in Syrian & Russian bombing of civilians: is this what Venezuelan Minister of Foreign Affairs Jorge Arreaza meant when he said of Assad: “So much experience, wisdom & advice for resistance, victory & peace”? Despite the corruption of the Venezuelan government, we stand steadfast in opposing any US or foreign intervention in Venezuela. We do not have to solidify with the Maduro regime to oppose military intervention & stand with the Venezuelan people. Would those who claim they support the Syrian Arab Spring & oppose Assad but also promote the Maduro regime as a bastion of popular democracy care to explain how the Venezuelan government can stand for democracy in Venezuela & counterrevolution in Syria at the same time? This is a quite useful article about Italian Deputy Minister & Interior Minister Matteo Salvini. 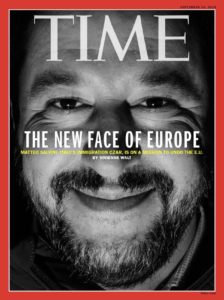 Salvini, who like many fascists began his political career as a Stalinist, is leading the campaign against Syrian, Iraqi, & African refugees & against the Roma & Sinti communities in Italy. The article describes his role in forging links with European nationalists & fascists & with Steve Bannon to create an international network or movement of anti-immigration, anti-Muslim, racist & fascist ideologues. There’s a wonderful video going viral of a 15-year-old Italian boy standing up against members of two fascist groups protesting the rehousing of 70 Roma people, including 33 children & three pregnant women, in the Rome suburb of Torre Maura. It’s the story behind the rehousing of Roma that is important & considerably less heartwarming. For several years now EU countries, including especially France, Spain, & Italy, have been attempting to identify Roma as “illegal immigrants” & despite violations of EU law deport them to Romania or Bulgaria from whence they did not come. Many have lived in Western European countries for hundreds of years. During these campaigns thousands have been evicted from their homes, seen their communities bulldozed, & been deported. In Italy, a systematic campaign against Roma & SInti residents began in earnest with the election of Silvio Berlusconi in 2008. Berlusconi was part of a rightwing coalition that included the anti-immigration Northern League, now called the League party. Whipping up racism & anti-Roma & anti-Sinti sentiment is a way for Italian capitalism to deflect popular opposition to its austerity policies, including massive unemployment. A coalition of the anti-immigration Five-Star Movement (M5S) & League party in the 2018 elections brought League leader Matteo Salvini to power as Deputy Prime Minister & Interior Minister, making him the official in charge of policing immigration policies. From early on, the campaign against refugees from Syria, Iraq, & primarily Africa was linked to the campaign against the Roma & Sinti communities. 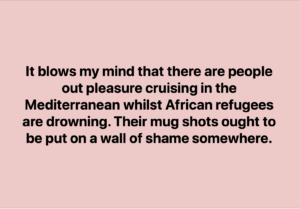 During the 2018 election campaign, Luigi Di Maio, a leader of M5S called for “an immediate stop to the sea-taxi service” bringing African refugees to Europe. Virginia Raggi, a member of M5S & the mayor of Rome since 2016, announced she would dismantle Roma camps in the city, calling the sites a “feeding trough for the mafia.” Despite violations of EU law, she claimed she had secured €3.8 in EU funding to dismantle the camps & deport or relocate Roma & Sinti citizens. Since he became Interior Minister in June 2018, Salvini has kept his racist promises by repeatedly refusing to allow refugees rescued in the Mediterranean to disembark in Italy. Last Thursday, he boasted on Twitter that he had turned away the rescue ship Alan Kurdi (named after the Syrian two-year-old who died in 2015 crossing the Aegean). On that boat were 64 African refugees, including a newborn infant, who had been rescued off the Libyan coast on Wednesday. Salvini also offered legal aid to two supermarket employees who in 2017 locked two Roma women in a dumpster after they were caught trying to retrieve food. The supermarket guys videoed the attempts of the women to get out & posted it on social media. The protests last Tuesday in Torre Maura, an eastern suburb of Rome, were instigated by the fascist groups CasaPound & Forza Nuova who are implicated in attacks on refugees & on pro-immigration rights groups. Without the shadow of a doubt, they are emboldened by politicians like Raggi & Salvini & are unlikely to be prosecuted. They showed up in Torre Maura to incite local residents against the 70 Roma being forcibly relocated from their own homes to a government housing project. 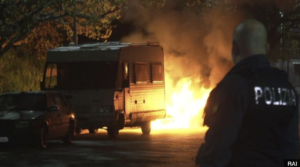 They set up barricades, set cars on fire, & destroyed food meant for the Roma. Media reports say the Roma were being “temporarily rehoused” but the question remains where will they be sent after this temporary relocation? To Romania or Bulgaria from whence they did not come? Did they agree to this relocation? Were their own homes bulldozed so they cannot return to them? Do Roma & Sinti have any human, democratic, or civil rights in Italy? Raggi ordered an investigation of the violence against the Roma & denounced the “very heavy climate of hatred” for which her polices against Roma & Sinti are directly responsible. Salvini, with detestable sarcasm, condemned the violence but promised to have all Roma communities in Italy closed down by the end of his term as Interior Minister. This photo is a Northern League (now called the League party) rally in Milan in October 2014 against an immigrant “invasion.” League leader Matteo Salvini, now Italy’s Deputy Prime Minister & Minister of the Interior, has been turning away African refugee boats from Italian ports & is engaged in a campaign to deport Romani & Sinti residents, over half of whom are Italian citizens. 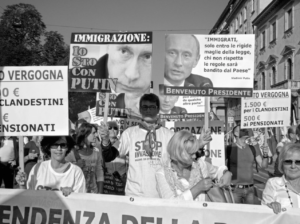 Those who believe the Mueller investigation vindicated Putin from a witch-hunt are on the same political trajectory as Salvini who began his political career as a Stalinist. 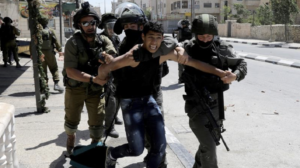 Palestinian Prisoners’ Association reports that at least 6,000 Palestinian children have been arrested by Israeli soldiers since 2015. Some were arrested & imprisoned after being shot & wounded. Almost all have been subjected to psychological &/or physical abuse while in custody. The total number of Palestinians currently imprisoned by Israel is 5,700, including 48 women & 250 children.